Dubai, a well known country by everyone, popular for its highest, largest, longest, First in the whole world. One of the highest, largest and the first things of Dubai is its largest Fountain famous all across the globe. Dubai’s Fountain is the largest fountain in the world set on a manmade Lake Burj Khalifa. 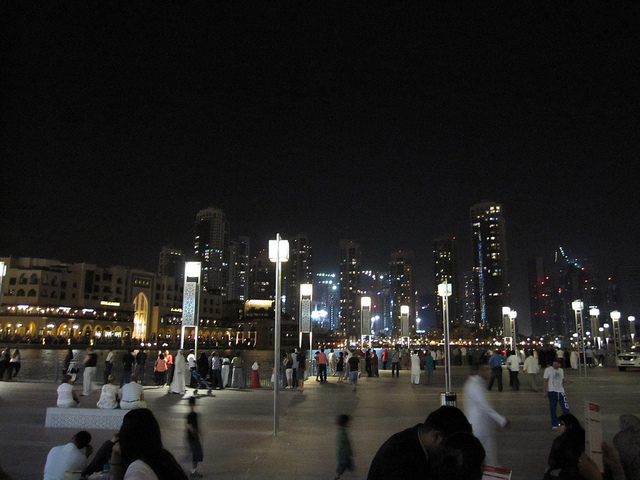 It is a popular tourist place in Dubai. The contract of this fountain was given to a California based company-WET Design which designed it exquisitely at a cost of USD 218 million. It is 275 m high that one can see it from 20 miles away. It is the brightest point illuminated on earth when seen from the sky that spot in the middle east. It was inaugurated on 26 October 2008. 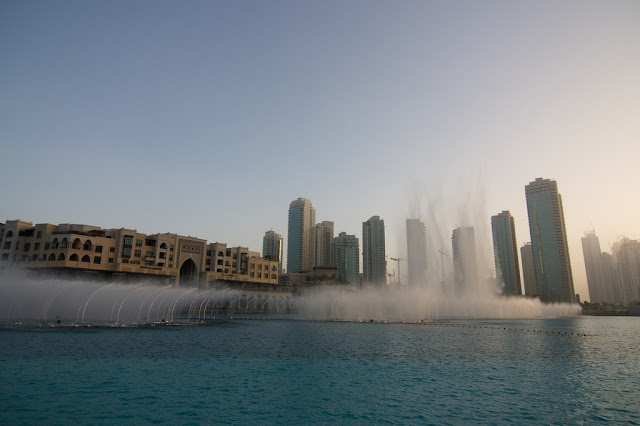 Testing of the fountain began in February 2009, and then was officially inaugurated on 8th May 2009 along with the official opening ceremony of the largest “Dubai Mall”. The length of this fountain was increased to 275 m after some time. This large and unique fountain is illuminated by 6,600 lights and 25 colored projectors. 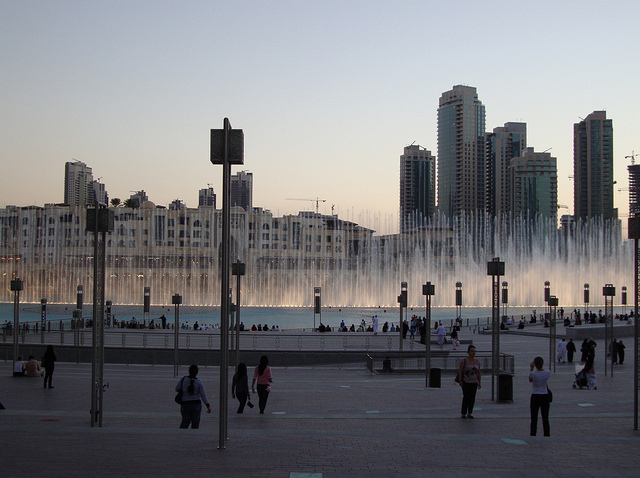 This fountain can spray approximately 22,000 gallons of water in the air at a time and shoots up to 500 ft into the air accompanied by a range of classical to contemporary Arabic and world music. It waters the air in many different combinations and patterns. This Fountain contains many high-pressure water jets and shooters that shoots the water even under more pressure up to 240 feet in the air and some extreme shooters are also there that shoots the water under the most pressured up to 500 ft. Shooters create a loud “boom” noise after the water is ejected. The main or super shooters use least of time like on the special occasions as it takes a lot time to build up enough pressure and energy to shoot water to such a great height in the air. One of the best things that exhilarate anyone after seeing this fountain is its dance performance. It dances on the national and famous songs like Sama Dubai, Baba Yetu, Shik Shak Shok, In Shed An Aldar, etc. The dance performance takes place at 1.00 pm and at 1.30 pm as well as every 30 minutes from 6 pm to 10 pm on weekdays, and from 6pm to 11pm on weekends. One can also enjoy a boat ride on the Burj Lake and a breathtaking view of Dubai Fountain. Through this ride, you will also be able to get a closer look of the famous tallest tower of the World named “Burj Khalifa” and thus make it a one time experience of your life. 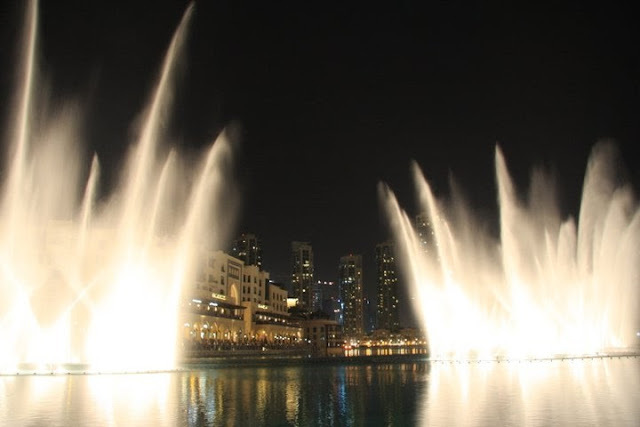 In the last, we can say that there are many iconic structures like this Dubai fountain in Dubai. A trip to this country will be surely memorable to anyone visiting it. Wow, that's quite a fountain! Thank you for your visit:) This is a very impressive fountain! So interesting to know about Dubai’s Fountain. Spectacular views indeed! But so artificial. Boom & Gary of the Vermilon River, Canada. Ok - I am impressed! it is beautiful, everything!! and it seems the area is very clean and not over crowded. i often feel overwhelmed in big cities like new york and it's the crowds, filth and homeless people that make me feel that way!! Wow, cool looking fountains! Wonderful photos! Have a great day! Hi! Nice captures. Very fantastic. Thanks for sharing. no doubt, dubai is an impressive city. Beautiful shots. I love the large fountain. Great post and as always, beautiful photos. thank you my friend. Thanks to you, I met an interesting place again. I must find an opportunity to spend some time in Dubai, rather than just transit through the airport, looks amazing. Wow!!! How gorgeous! Beautiful photos! Thanks for showing the wonderful fountain. I think the Burj Khalifa was featured in a Mission Impossible movie. Well someone finally out did Vegas. That fountain is spectacular. This set of pics is amazing ! I discover this fountain with a lot of pleasure, thanks for sharing it. Reading about the fountains, I will just say wow! Dubai does invest in a lot of unique attractions. Great information. Thanks for sharing.